I’m always on the hunt for a spot to enjoy cocktails and shareables with friends. A handful of restaurants have opened within the past year that hit the bull’s-eye, and one of them is Madison. The first time I walked the long, narrow hallway to the left of Madison’s tiny façade on Park Boulevard, only to have the space open up into an indoor/outdoor patio protected by a dramatically high, arched wooden ceiling, my expectations soared. The place looked cool. Geometric designs of circles and triangles abound in an area made cozy (despite the occasional breeze) by the wood and heat lamps. The cocktails are excellent and, at $9 each, they’re also fairly priced, considering the quality ingredients. My favorite so far is the Umbrella, a spicy concoction featuring St. George Green Chile Vodka (which I’m seeing everywhere these days) with cucumber, lemon, and club soda. If you’re in the mood for something darker, I recommend the Vieux from Above with Rittenhouse Rye, Cynar, Ancho Reyes Chile Liqueur, lemon, and Giffard Orgeat (fancy almond-flavored beet syrup). I’ve been to Madison twice and have loved every bite, save for one — the Buffalo burger ($17). The preparation was fine, with melted smoked mozzarella cheese, tomato, and romaine on an exceptional brioche bun. And my friends loved it (after taking a bite, I offered it up to the table), but it turns out I don’t care for the gamey funk of buffalo meat. Which is fine, since the shared plates are where it’s at. When I learned that the man behind the food here is the same guy responsible for the fare at Bice and Buona Forchetta, it all made sense. Madison is right in the middle — not as fancy and expensive as Bice, not as casual and dog-and-kid friendly as Buona Forchetta. Mario Cassineri, who grew up in Milan, brings his home country’s focus on flavor and freshness everywhere he goes. 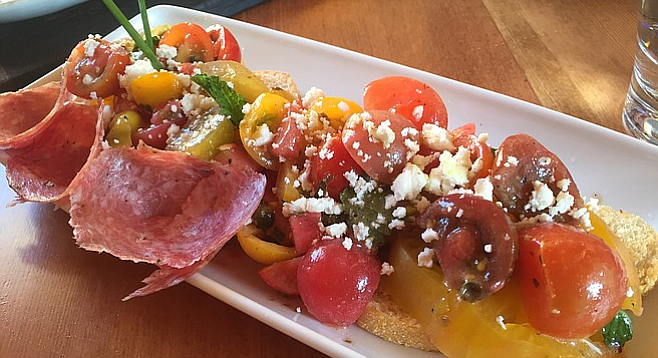 Take Madison’s Tomato Salad with its medley of heirlooms, watermelon, mint, feta, capers, and soppressata all spread atop three slices of toasted baguette ($12). The salty salami, feta, and capers offset the sweet tomatoes and succulent watermelon, and the bread works well to quell any bits that might otherwise be too bright or sharp. The Tuna Tartare ($12) is excellent in a different way. Instead of seasoning with many ingredients, this simple and beautifully presented dish is pared down, allowing the delicate flavor of the fish to shine. It’s just the ocean-fresh tuna seasoned with citrus and sesame, wrapped in a thin slice of cucumber with crunchy shrimp tempura sprouting from the center and an artsy display of crème fraîche dollops on the plate. The Steak Salad ($13) is a Paleo-diner’s dream, as it really focuses on the meat. Sliced skirt steak appears alone on a plate, garnished with a bit flower and greens garnish. The plate sits on a wooden board where it shares some space with a sampling of accompaniments: guacamole, citrus yogurt sauce, and chopped salad with quinoa. Even the hummus here — often the most boring item on a menu — is packed with flavor. This is a cumin-centric curried onion version ($9) served with a dish of garbanzo beans, pickled cauliflower, and toasted pita. As Madison is only a few miles from where I live, I have a feeling I’m going to be back again soon.